We've developed a solid marketing plan for our sellers utilizing traditional and digital marketing tactics that support each other with professionally designed marketing materials, professional photography, a diverse print and digital advertising strategy, a wide network of real estate agents and their buyers, and updated reports on each listing that allow us to change tactics as needed. With a competitive market analysis and detailed marketing plan, our listings sell quickly and at the best price possible. Your home is immediately listed on the Multiple Listing Service which updates a daily catalog of homes for sale through its member brokers and an online network, available to its members, with photos and descriptions of all listed properties. We personally submit photos and the descriptive elements of your home to ensure that you have the best possible representation on the MLS. All of our property listings are Featured Listings on our website as well as on all local and national websites that subscribe to the Multiple Listing Service. Our websites are constantly updated and optimized by our marketing staff, SEO specialists, programmers, and designers and include the most advanced tools available, including Active Maps and automatic email notifications, to continuously bring prospective buyers back to check the latest real estate search results. Prominent 'For Sale' signs are placed on our listings along with a brochure box containing photo/property information flyers. This form of advertising has proven to be a solid source of interested buyers over the years and has brought us a number of buyers. As soon as we receive your signed listing contract, one of our professional graphic designers creates a modern flyer for digital and printed distribution from professional photographs for the best possible presentation. 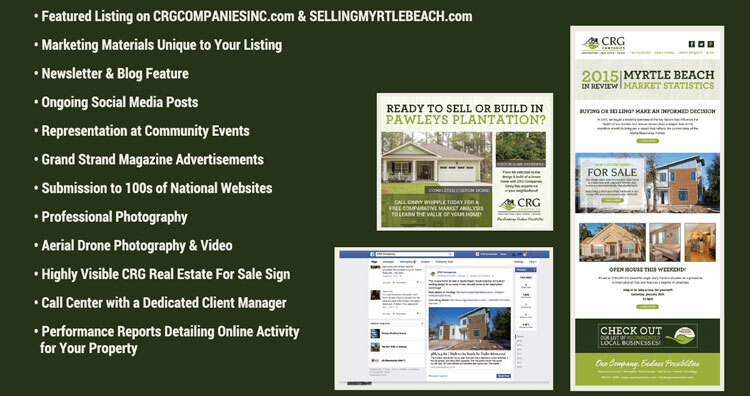 We advertise all of our listings and websites in a wide range of highly visible areas like the popular Grand Strand Magazine that features a full spread ad and strategically placed billboards in high traffic spots. We've also contracted highly respect Pay-per-Click (PPC) and SEO specialists that ensure our online ads receive as many views as possible every day and our listings are easily reached in search results. One of the most beneficial additions to our marketing plan and real estate team is our Customer Relationship Manager (CRM), Rainbow Russell. In addition to a welcoming name and personality, Rainbow's background includes an MBA and years of experience in real estate and she specializes in assisting our leads with their real estate search by walking them through the process of determining the area that best fits their needs and wants, searching real estate listings for properties they might be interested in, and finding the best real estate agent to finish the last step of the home search process. This allows our agents to focus on what they do best: showing homes to interested buyers, learning more about the buyers, and negotiating the sale. We're always looking for the most efficient way to serve our clients' needs whether they're buying or selling property in the Myrtle Beach area.